The protectability of colors has been a topic of conversation this week, as almost five years after the Second Circuit Court of Appeals ruled that Christian Louboutin does, in fact, have a valid trademark in “Chinese red” for use on the soles of shoes (as long as those shoes are not monochrome red), the U.S. Patent and Trademark Office’s Trademark Trial and Appeal Board (“TTAB”) has put an end to a two-year-long battle over the protectability of the color yellow. Not quite within the scope of fashion products, but a color war, nonetheless, the TTAB has held that General Mills’ 76-year old Cheerios brand cannot claim exclusive rights over the yellow hue that adorns its cereal boxes. Why? Well, according to the TTAB, because many breakfast cereals also sell their products in yellow boxes, that’s why. It is important to note that the ability of consumers to identify a trademark – whether it be a color, a name or a logo – with a specific brand is the core concept of trademark law. The TTAB’s decision in the Cheerios case is also a timely one, as it comes as Louboutin continues its mission to secure legal protection for its red-hued shoe soles outside of the U.S. As recently as this spring, the Paris-based brand suffered a loss in Switzerland, when the Federal Supreme Court in Lausanne affirmed a lower court’s 2016 decision, which classified the brand’s famed red sole as a “decorative element,” as opposed to an identifier of source. (As noted above, it is imperative that the color be used to identify a specific brand – and not merely be used in a decorative function – in order to classify as a trademark). In its decision in March, the Supreme Court held that while Louboutin does maintain trademark protections in other countries, including the United States, China, Russia and Australia, that does not mean it is entitled to the same level of protection in Switzerland. All the while, Louboutin has been embroiled in a battle against Dutch footwear brand Van Haren over … the red soles, of course. Louboutin filed suit against the rival footwear maker in 2013 in the Netherlands, seeking to force Van Haren to stop selling its own red soled shoes under its own brand name. In April 2013, the District Court of The Hague awarded Louboutin a preliminary injunction, ordering Van Haren to cease its manufacturing and selling of black and blue shoes bearing red-soles, and to pay Louboutin's court costs and legal fees. Van Haren appealed this decision and in March 2014, the Courts of Appeals referred the case to the Court of Justice of the European Union to determine whether Louboutin's trademark is valid. The European Court of Justice’s advocate general, Maciej Szpunar, issued an opinion in June stating that the EU trademark law could, in fact, apply to and protect a shape in combination with a color (in this case, high heels and bright red) – which bodes well for Louboutin. A final decision in that case is expected within the next few months. PayPal goes on to note that one of the “hallmarks” of its logo – in addition to its “minimalist look and feel [and] sans serif font,” is “the distinctive blue color palette.” With this in mind, the case will almost certainly center, at least in part, on the parties’ use of the same shade of blue and which – if either – can lay claim over it. As for what other brands have been able to secure exclusive rights on their signature colors in the classes of goods/service in which they use the mark: Tiffany & Co. has federal trademark protection for its robin’s egg blue, Gap has monopolized its navy blue, Home Depot for its orange, UPS for its brown, T-Mobile for its magenta, and Post-it for its very pale yellow hue, just to name a few. While the PayPal v. Pandora case, Louboutin’s various intentional cases, and still yet, the case between Cadbury and rival Nestlé over a shade of royal purple, are still undecided, it is accepted as good law – in the U.S., at least – that single color trademarks are registerable, protectable and enforceable, even within in the fashion industry, where arguments are often made as to the necessity of designers being able to freely use the entire spectrum of colors. The ongoing war over color also serves as a reminder to brand owners that - as the Supreme Court held in the mid-1990's in Qualitex Co. v. Jacobson Products Co., color can be registered, as long as it identifies the source of the products. As such, trademark law enables brand owners to protect the distinctive features of their designs, even if the distinguishing feature is just one color, but only if they can show that consumers have come to recognize the that feature being connected to the brand. And in completely separate matters, outside of court, as of late last year, Anish Kapoor - the artist who owns the rights to the blackest shade of black - is up to his old tricks, retaliating against a ban that prevents him from buying the world's pinkest paint by acquiring it illegally. More about that right here. UPDATED (10/18/2017): John Deere and Company has won a trademark dispute with a South Dakota-based agricultural equipment company ... over color. A federal judge in Kentucky has held that FIMCO Incorporated cannot use "John Deere green and yellow" on its products. There is another outcome to a legal battle over color that we to add to our list of both inter- and intra-industry matters, which includes: Louboutin, which, as we learned in 2012, can legally claim trademark rights in its red sole in the U.S., as long as the body of the shoe is a contrasting color; and Cheerio’s, whose yellow box is not distinctive enough (largely due to the significant number of other manufacturers that use yellow for their own cereal boxes) for the cereal maker to claim exclusive rights in it, the Trademark Trial and Appeal Board held earlier this year. There is a big difference between a tractor and a t-shirt. But courts (or the U.S. Trademark Office) sounding off on legal rights in regards to colors – no matter the object – is worthy of a note. Yes, regardless of the outcome, is the importance that color plays in a brand’s enduring identify and its marketing strategy. 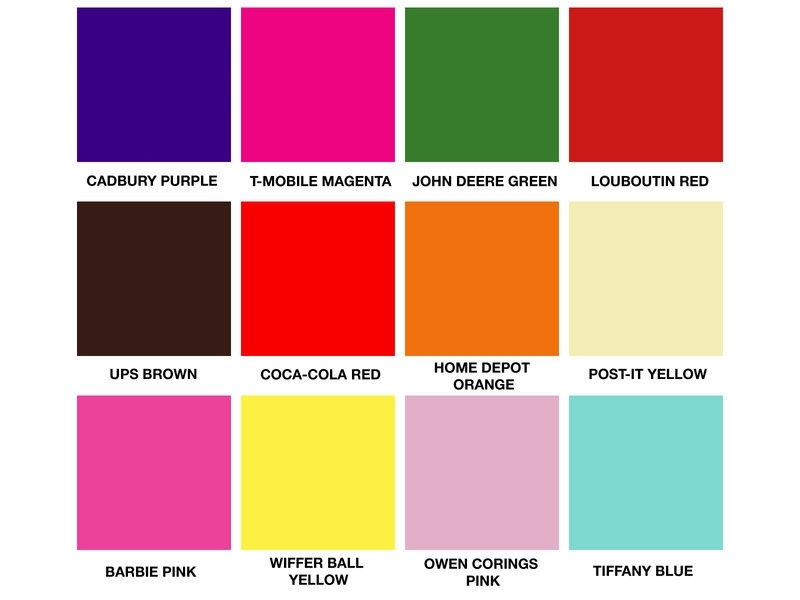 In much the same way as a trademark serves as an immediate indicator of the source of a product or service for consumers, color can play serve an important source-identifying feature. Similarly, just as many brands have been able to monetize the recognizability and appeal of their trademarks, they are increasingly looking to color for the very same benefits.